Here we've lovingly posted what we like to call The Good, the Bad, and the Ugly. First The Good, of course. I decided I wanted to add one of these wonderful little dogs to my family of two rescue cats. Excited and full of hope, I contacted the Basenji rescue folks and found that a dog was available ... and only about 40 miles from my house. (sigh) It must be fate! It was only then that I began doing my homework and researching the breed. I bumped into these reality stories on BRAT's Web page. Amusing stories, cleverly written, but surely not real! Oh no, no, no! They've got to be fiction. Who in their right mind would own such a breed? Dogs that eat mini blinds and chew everything in sight!?! Surely the owners of these animals are the most loving, patient, easy-going people on earth. It must be these horrible dogs! Naturally, I began to think twice about this rescue business. That night, I dreamed about a Basenji with teeth like an alligator, biting through his lead as I held it, chewing a hole in my chain link fence and escaping to Iowa during a brief moment of inattention while I sneezed. I forged ahead, in spite of my fears! Can you imagine my pleasure (and relief) when I actually got to visit my new girl and the first thing she did was lick my face then poke her nose in my jacket pocket looking for treats? Did somebody say they were aloof? Morale of the story: Now I understand why the authors of the reality stories hang in there with their dogs. This breed has a way of getting to you, real quick. And once they get to you—like potato chips—one just isn't enough. 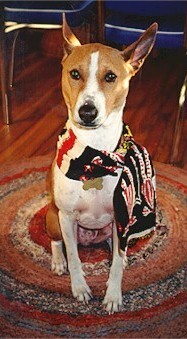 It has been almost six years since I adopted BJ from the Dallas Basenji Club. BJ was very smart. He would give you a high-five and even roll over for a treat. He used to growl and even bark at me when we played while he hopped up the stairs backwards facing me. He was quite an entertaining dog. My mother never liked dogs and she never allowed dogs in her house. Shortly after I got BJ my mother had a stroke. She developed a liking for BJ and they became the best of friends. I have a picture of BJ in bed between my mother and dad! My mother had another stroke and was in the hospital for some time before she passed away. She would always ask about BJ and how he was. I sneaked him into the hospital to cheer her up. It did, and all the nurses came in to see him and they loved him. BJ helped me get through some tough times. When I took BJ to my folks house after my mother's funeral, BJ looked all over for her. When he could not find her, he slept on her pillow for weeks. My dad still has that pillow and every time we visit my dad, BJ would always sleep on it. My dad, now 82, loved to keep BJ for me when we were out of town. He remarried a few years after my mother passed away. Wanda did not like dogs either, but BJ changed her and she loved him. She always looked forward to keeping BJ. Wanda passed away last year. I was single when I got BJ, but he quickly took a liking to Nancy, my girlfriend. When we were dating he would get on the couch between us. After we were married, he would sit on her side of the couch! BJ was Nancy's walking buddy. They would go for walks and BJ would get to see all of his neighbor dog friends. BJ loved to lay in the sun. We have decided to bury him in a sunny spot in the back yard and call our deck/spa/fountain area, "BJ Park". As dog lovers, I know you would understand this! We will miss him. As you can see, BJ has helped a lot of people through some difficult times. He never met anyone he did not like. Thanks for the memories, BJ. May you and your dogs enjoy a long, happy life. I was asked to write about our Basenji mix Lizzie and her introduction to our two resident cats, Ozzie and Flicky. By posting this, we hope to prevent other Basenjis from needing to be rescued due to cats in the family and help those who are thinking of mixing the two. First off, a little reality: It's not always easy. Nothing to do with raising Basenjis or cats or dogs or kids or living life is easy. But it can be done <g>. I have no magic recipe but I do know that the first, only, and main ingredient is patience! Lizzie is a rescued Basenji mix who has been with us almost a year. She is sweet, lovable and energetic. She sometimes gets frightened with strangers or kids. If given time she warms up to everything—even the cats. Our first cat is a big fat boy named Ozzie. Ozzie has two goals in life: to find a warm, soft, comfortable place to lay (preferably on my wife Alysia); and where/when is he going to get his next meal. He is extremely sweet and lovable, likes everyone and is often known to jump on a guest's lap after a lengthy two-minute courtship. He and Lizzie get along fairly well. They will often lay on the bed or sofa next to each other, sometimes even touching noses or sniffing each other for a few seconds. Flicky, our other cat, on the other hand, is scared of his own shadow. He spooks at everything. He tolerates Lizzie but is much less friendly about it. When we first got Lizzie, we would put her in her crate and let the cats wander around, smelling her and getting used to her noises. Lizzie barked her head off—remember, she's a mix. After a few “lets get introduced” sessions with her in the crate and the cats circling, we got up the nerve to introduce Lizzie while she was on her leash. That was a bit more adventurous as she really wanted to chase after them. With a lot of patience which included sitting quietly, petting both animals, talking to the cats and the dog, etc., she calmed down enough that she wasn't always jumping and moving after them. Once we set everyone loose in the same room we found out that it was okay. Yes, Lizzie does fly down the stairs after the cats when they run to the basement but she makes no effort to ever actually catch or bite them. To the cats′ credit, they've never tried to harm Lizzie. And with all claws intact they could do damage, if they really wanted to. I think we have been very lucky that the cats are as gentle as they are and Lizzie has sustained no injuries from them. I really think that with lots of patience, love and supervision you can get any mix of cats and Basenji [mixes] to get along. My beloved Basenji, Timmy, has been gone since 1990, but I laughed and wept when I read these reality stories. He developed diabetes, lost his sight, and had to be injected with insulin twice a day. Nevertheless, this intrepid soul stayed with us for 14 years. I, too, had been unprepared for life with a Basenji. Timmy had been found, abandoned, in a packing crate in the basement of an abandoned building in New York City. He was three months old. A young single woman at the time, I fell in love with him and his story. Soon after I adopted him, my beloved grandmother died. I was lying on the sofa, crying, when this little dog climbed up on my chest, put his face just inches from mine, screwed up his brow in that quizzical look, then began to cry along with me. Real tears began flowing down his face as he mirrored my emotions. When I married and we left the city, we put Timmy in the family room, closed the door and left for work the first day. When we returned, he had burrowed almost completely through the wall leading to the back yard. If the house had not been made of brick, he would have been gone. Wallpaper was also peeled in other areas, and I saw springs in the sofa where none had appeared before. Obviously, that wasn't going to work, so the next day we gave him free reign. When we returned home that evening, Timmy was sitting proudly at the top of the stairs. Displayed neatly, and with military precision, was a lineup of our shoes. He had gone into both closets, carefully brought each shoe out, lined them up in pairs on the landing and waited. This was, we understood immediately, a warning. Leave me alone again, and these hostages will be gone. Wasted. We immediately bought a crate. I could regale you with Timmy stories forever, and I'm sure you could all relate. I now have a long-haired miniature dachshund, who is sweet and loving, but someday I will return to the fascinating, challenging world of Basenji-dom! Some Basenji behavior can not be trained out of them—taking chase after a critter, getting into the garbage, shredding tissue, bolting out the door, and counter surfing are just a few of the “talents” Basenjis possess. You can try to manage the behavior, like teaching a solid “wait” command at the front door, but for the most part Basenji owners learn to have a sense of humor about the quirks of the breed. Like shredding tissue and getting into the garbage. We put our tissue “up” out of their reach and lock up our garbage. We remove the temptations. We got Zena, our first Basenji (and only puppy) in 1995. She liked to grab the end of the toilet paper and run. It was cute the first time she did it, but after that, not so much. We put the TP out of her reach. We're now smart, official Basenji owners! Not! We got Cooper at 10 months old and he chewed a hole the size of a dinner plate in a leather chair. And this wasn't cheap, chintzy leather. We bought the thickest, most durable leather we could find because of the dogs. And he wasn't unattended. I was in the next room and he was in my line of sight. I got up and when I saw what he'd done all I could muster was a gasp. I had no idea a dog was capable of such destruction in such a short period of time. Cooper chewed and chewed and chewed. We made sure he got lots and lots of exercise to wear him out, but still he chewed and chewed and chewed. He just liked to chew. I still find little things around the house bearing teeth marks and I know it was Cooper (who has been gone since June 2011). Last Thanksgiving Cody (our sixth Basenji, pictured here, attempting to tip over a steel drum garbage can) learned to open the cupboard where the kitchen garbage lives. (Hum, wonder what he was after?) The technique: He bounced his paw against the door until it opened just far enough to get his nose in. And then he got really good at it. Don had a tough time finding a child lock that worked with our cupboard, but he finally got it handled. And yes, he can tip the steel drum garbage can over. It's not what's inside that's important; it's what he thinks might be inside. Lexi (our seventh Basenji) is on the upper end of the naughty scale. Anything left even close to the edge of the kitchen counter and it's outta there. And can she jump cat-like from our window seat to the kitchen counter? Oh, yeah, baby! And we're neat, clean people. There's nothing on the counter. She just has fun nosing around. But she is also on the upper end of the sweet scale. So what can I tell you? I have dog training skills, I just haven't worked with her much and I don't know that it would do any good. The Basenji females seem to want what they want. Do you remember Cyndi Lauper's 1984 hit, Girls Just Want to Have Fun? So, all I'm saying is, the Basenji can be a very challenging breed, some more than others. I was a single mom of two boys and Basenji Chi Chi when I began dating Thom. One weekend I had to go out of town and I asked Thom to care for Chi. He agreed and I brought her to his condo. She sniffed every square inch of the place and I warned him to cage her when he was at work. I returned to a hysterical story of Basenji vs. Man. Man lost. Thom had always loved golden Retrievers and was used to a lap-, obedient-dog. He thought if he called Chi she would come and was unprepared for her independent nature and speed. One morning, while Chi was in his care, he opened the back sliding door and she took off. Worried that if anything happened to my sons′ pet, he would definitely lose favor with me, he took off running after the her, still in his boxer shorts. By mid-morning Chi had run him into the ground. At one point Chi stopped to “chat” with two elderly women taking a morning walk. Thom yelled to the women to “grab that dog.” They held on to her and then commented on how beautiful and “deer-like” they thought she was. Thom—not feeling like talking about her beauty at this time, particularly in his boxers—quickly took her home. At home he opened the front door and tossed her in. Chi, being the smart thing that she is, runs through the house immediately to the back sliding door that Thom had left open and the chase was on again! 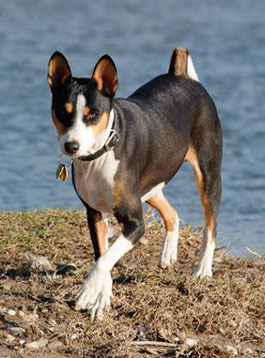 Basenjis are not an off-leash dog. And, if Basenjis aren't exercised the only option is constant stimulation to keep them from finding their own amusements (my underwear, the pillows, the blinds, the contents of the trash, the cat, whatever—definitely not what you'd like them to be busy with, viz. their toys). I always worry about people who list short hair and no bark as appealing qualities. Basenjis are pretty high maintenance, despite their low maintenance look. Some people say the dog must not be destructive. Well, I wouldn't call Lulu destructive but she is an energetic and enthusiastic chewer. She has eaten several hundred dollars worth of clothing, removed our vertical blinds in the dining room—ok, I agree, they needed to be replaced with something else—destroyed every $14.00 plush toy we gave her in minutes (we must be slow learners), and decided that tassels do not belong on pillows—again, she may be right on this point. Lulu is of course one Basenji among many. On an aloofness continuum from 1-10, 1 being the most aloof, she hovers at .5 (yes, that's point-five), except at dog parks and lure courses where she's a total extrovert. She is affectionate in her own way but no where near the expressiveness of a Pug or Border Collie. She has her own agenda. People are a low priority. 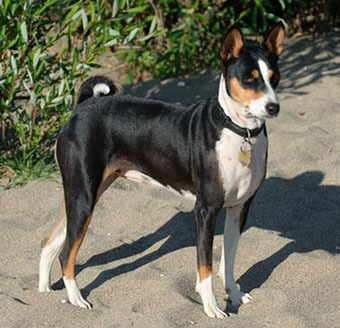 Potential Basenji owners need to know this is a possible character trait or the match will be a disaster. 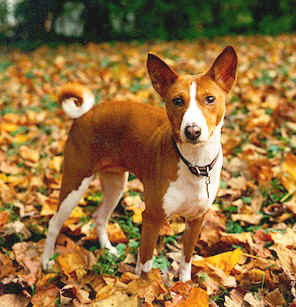 Of course there is a range of Basenji personalities. The Basenjis I've known all tend to be intense. And they are focused. Even at their most playful they aren't anything like the hyper-active Jack Russell. But their intensity seems cooler than that of European hunting hounds—nothing like a German Short Haired Pointer, or a Vizsla. Basenjis are explosive and strong but don't seem as emotionally fragile as Boxers. Still, they certainly aren't couch potatoes. 1) Hide and lock up securely any garbage receptacles of any kind. This especially includes bathroom garbage containers. Even though you may plan to keep your dog out of that area, they will find a way to get to it. 2) Purchase the highest quality child safety locks you can find for cabinets that contain any kind of food product or cleaning supplies that might be interesting or used as shredding material (like dryer sheets or paper towels). If you don't have young children, prepare an explanation for your friends as to why all of your cabinets have these difficult-to-open mechanisms. Be aware that your Basenji may figure out how to open these latches so be on the look-out for a new and more difficult type that you can switch to in case this happens. 5) Do not plan to reprimand your Basenji to discourage a given behavior. Although some dogs are effected by reprimands (i.e. 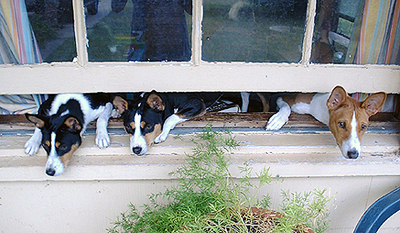 they look forlorn for some time after) the Basenji is undaunted by such action—a canine sociopath of sorts—and the unwanted behavior will most likely continue. 6) Don′t plan on talking on the phone in peace in the presence of a Basenji unless the dog is thoroughly exercised, asleep or crated in another room. I haven't met a Basenji yet who could tolerate their owner talking on the phone. Plan on purchasing a portable phone if at all possible to discourage the perception that you're “unavailable” while on the phone. 7) Expect your dogs to chase anything that runs. These are hunting dogs by instinct. This includes cats, other dogs, children, wild animals, etc. Even if your dog is socialized around cats and tolerates them, I believe that a Basenji and a cat that live together have a one-sided agreement: The cat agrees not to run away from the dog, but instead to stand its ground or to head for high ground when appropriate. 9) Plan on integrating your dog into all parts of your life. Make friends with people that have dogs, so your dogs have “friends”. Plan weekend outings that include your dog. Your life will be much more fulfilling and enriched if you integrate the dog into it instead of trying to “cope” with the dog as part of our life. 10) Plan on falling madly in love with your dog and being completely blind to what other non-Basenji owners think are shocking behaviors. I think that most humans are attracted to those that play hard-to-get and most Basenjis know that game well <grin>. When I rescued my Basenji, Penny, she was very ill with mange, hookworms, roundworms, dehydration, and malnutrition. While I had great hopes that she would heal into a happy, healthy dog, the first few weeks were rough. She was hairless and skittish, and she spewed diarrhea all over my living room the first moment after I brought her home. Cleaning cost: $250. She was very weak and could barely eat, so I thought, foolishly, What harm could this sick Basenji do if I left her alone for 20 minutes? I had heard the tales of separation-anxiety and destruction but assumed that she was too ill to cause any damage. I had planned to crate her, but I felt so sorry for the sick thing, asleep on the couch in the sun, that I left her alone. That weak, sick, bald, timid little creature (who could not even climb stairs at this point) summarily and completely destroyed the room where I left her. Here is the list: She removed all the molding around every window; removed the baseboards on every wall; gutted a sofa; trashed the screens on every window; annihilated the mini-blinds on every window; removed the screen door from its hinges and somehow mangled it into an almost-unrecognizable hunk of twisted metal; severed three Ficus tree trunks; tore up the carpet in all four corners; destroyed eight throw pillows; removed and shredded the cane seats of two chairs; toppled six potted plants and dragged potting soil throughout the room; and capsized and broke a glass-topped coffee table. Repair and replacement cost: $1,200. 3. Do not assume that your Basenji will get over any initial separation-anxiety (last year I left her alone for 10 minutes and I replaced $400 worth of mini-blinds). We purchased our beloved Basenji from a pet shop. This was the first dog for my husband and myself, and unfortunately, we were not aware of the horrible conditions in which some dogs sold to pet shops are reared. Nor did we have much knowledge about this particular breed. Oh sure, we bought several books on Basenjis before we made the final decision, but ultimately these books glorified the breed and mentioned not one word against it. And of course the girls at the pet shop simply went along with every question we asked, only wanting to make the sale and caring nothing for the puppy′s welfare. We asked if the breed did well when left alone for long periods of time and we were concerned about her problem with biting. (When you extended your hand to her, she would bite, bite, bite, and bite harder till she almost drew blood.) The pet shop associates simply told us that this was normal behavior for a puppy and that she would soon grow out of it. They also told us that Basenjis did well on their own, unsupervised. Imagine our surprise when we brought the puppy home only to discover that her behavior was more destructive and counterproductive than we could ever have dreamed in our worst nightmares. We fought diligently against her behavior, trying to train her using all information on dog training available. With each reprimand, she would grow more and more hostile toward us, and if spoken to in even a slightly harsh tone, would run circles all over the house, tearing up everything in her path. We just could not understand what the problem could be. We read the training guides over and over again, hoping that we had simply missed a step somewhere and that we were the problem. Long weeks of nerve wracking obedience training became more and more futile. With every attempt to discipline her, she would become more aggressive toward us. It was then that I first heard of BRAT. We thought long and hard about giving her up, knowing that she would probably be better off with someone who had experience with this particular breed. It was ultimately my husband's decision to keep her. I was all for letting her go in hopes that she could find an owner more suited to her needs. We held on to our little “Pistol,” and two years later, we love her more than we could love anything in the world. She is our pride and joy. With lots of thorough research and hard work on our part, she has become an obedient, loving dog. She has come quite a long way since the day we first brought her home. Housebreaking was an ordeal from the beginning. Finally now she is beginning to understand that she must go outside and not on the carpet. Left to her own devices, however, she can still be very destructive. She cannot be left unsupervised; she must be crated, even for short periods of time. She still chews everything in sight, and will never come when she is called, especially when she is in danger. We learned the hard way that our Basenji cannot be trusted off of the leash, when we had let her outside to play one sunny day and she never made it back to the house. She was looking up chasing a flock of birds and never saw the car before it hit her. She received a severe concussion and some broken bones in her left rear leg. We rushed her to our vet and not long after he recommended that we take her to an orthopedic surgeon at Auburn University. Almost $1,000 and an entire year later, we never let her off her leash outside, even for a matter of seconds. Sometimes I pity her because I feel that her freedom has, in a sense, been taken away, but she cannot be trusted. Looking back now on all our experiences with Pistol, I realize that maybe she didn't get that much better after all. We just got used to her temperament and mannerisms and love her more with each passing day. When the time comes for us to say our final good-byes (hopefully several years into the distant future), I know it will be almost unbearable. Owning a Basenji is not an easy task. In fact, it is next to impossible. But with adjustments, acceptance, and constant love, we have made her an unforgettable and wonderful part of our lives and we will cherish her always. Ya wanna hear a reality story? 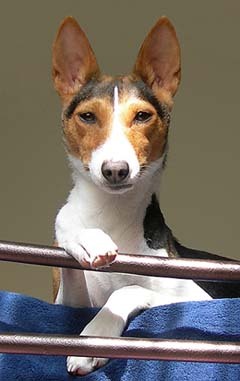 My first Basenjiwhewnow that was a boy who taught me about Basenjis! About 20 years ago, my son and I answered an ad for a Basenji for $75. When I walked into their house I saw a large pile of debris in one room and I thought at first that they were remodeling. Yeah, remodeling, right, Basenji-style! We took home the youngster anyway and he was such a brat, although nothing I hadn't already experienced with the German Shorthairs. Besides, this guy was a little tiny thing, so what kind of damage could he do? When I went to work, I didn't crate him. I was only going to be gone six hours and so I thought a little guy like this shouldn't need a crate. When I returned home I walked in to find about $10,000 worth of damage to the small rental house we lived in. The ball-feet were chewed off the still-standing pecan dining room table; the couches and chairs were down to the springs; drapes were down and shredded; door, window moldings, and sills were gone; the rug was torn up off the floor; and the little dear was in the process of digging through the wall to the outside. In fact, he was through the plaster, through the lathe, and had reached the cedar siding when I caught him. Amazingly, I didn't get angry, I was too stunned to speak! 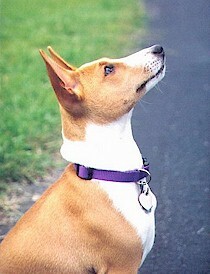 I was quite impressed with this little Basenji's “abilities”. Needless to say, I bought him a crate. Later that day I thought it best to take him with me when I went to pick up my paycheck. He wasn't crated in the car. I was gone five minutes at the most. When I returned (sigh) he had done a number to the inside of the car: Steering wheel chewed through and half gone; upholstery down to the springs and no piece of vinyl or cloth was where it had once been. He had stripped the inside of the car. This made driving home quite uncomfortable and interesting. After that he rode in a crate. These are just two of the multiple horror stories we went through with this little monkey. Still, I lived with and loved that little guy until the day he died at eight years old. And I thank him for teaching me his Basenji ways. Very good lessons learned, though I wish I had been more prepared for his homecoming.